Perhaps the hottest summer release of the year is No Man’s Sky by developer Hello Games, a game that promises an entire galaxy to explore featuring literally millions of planets and star systems to visit. 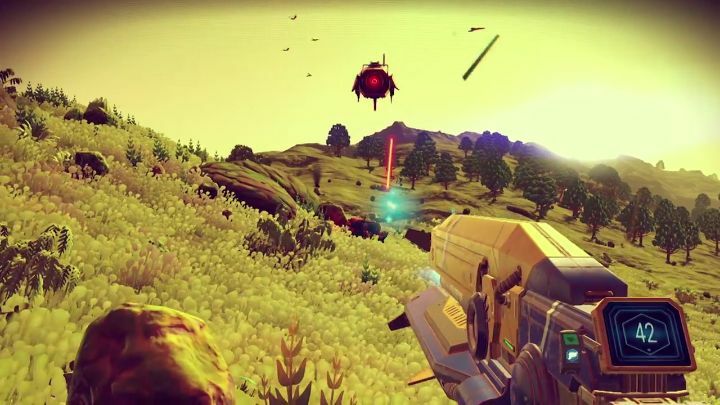 And in order to get gamers excited about and geared up for No Man’s Sky impending release (the game ships on August 9 for PS4 and PC), Hello Games has begun releasing a series of trailers highlighting different aspects of the game, the first of which focused on exploration and the myriad planets with different alien lifeforms that players will be able to visit. No Man’s Sky most recently released trailer is not about peaceful exploration though, but about fighting to survive in the game, as it’s clear that not all lifeforms in the game’s universe will take kindly to the player’s wondering about their homeworlds… And the game will not only feature first-person combat on the game’s alien planets, against both robots (like the towering bipedal mech seen in the trailer) and dangerous organic creatures, but also space dogfights featuring large capital ships as seen in other games like the crowdfunded sensation Star Citizen. If one thing is clear though, is that No Man’s Sky humungous universe and procedurally generated planets offering almost endless replayability have made it one of the most desired games for fans of space and sci-fi video games, and hopefully Hello Games space epic will live up to the hype when its released this August. Note: No Man’s Sky will be released on August 9, 2016. Available on PS4 and PC. Windows 10 upgrade offer expires on July 29 – should gamers upgrade?